How useful is a scrapbooking sketch? Very useful. Right on this page, you’ll find sample double-page scrapbook layout sketches for your personal use! I’ve been using sketches by different sketch artists for a while. They help me to plan out my pages better, save me time, and generally let me scrapbook better. After looking at various scrapbook sketch artists’ styles, I’ve come to really appreciate those clean and simple sketches that allow scrapbookers the freedom to experiment, explore, create and be creative. So I too wish that my simple sketches will become a useful “planning tool” for you. 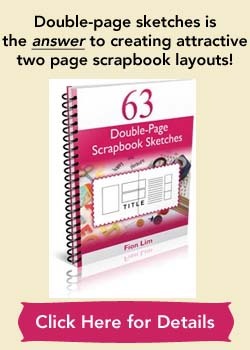 Right below you can find 5 sample sketches from my ebook, 63 Double-Page Scrapbook Sketches. Test-drive these sample sketches and if you enjoyed them, be sure to check out my full collection of 63 double-page sketches which is available in an electronic book (eBook) format. All the sketches in the eBook have been arranged and organized according to the number of photos, a feature which is a great time-saver for busy scrappers like you. There’s more… 12 bonus sketches in this eBook that have never been featured here or elsewhere! You can find out more details here. 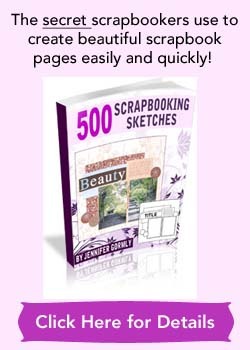 For an amazing collection of scrapbook layout sketches for single pages, be sure to check out 500 Scrapbooking Sketches. 5 Samples Sketches from eBook! Please note that the below sketches are numbered according to their number order in the e-Book. This is a simple scrapbook sketch. Instead of one main focal-point photo, the two 6×4 photos on the left page form the focal point. The left big curve where you can add in a title gives the whole layout a more edgy look. The right page allows more photos to fit in. There’s enough lines for you to pen down a few thoughts as journaling. This scrapbook sketch is set out for 6 photos of various sizes. The three semi/full circle shapes are there to help move the eye from the title of the page to the photos in the middle and then finally over to the journaling. The big full circle at the center helps to bring unity to all the photos. It’s a fun and eye-pleasing layout. This scrapbook sketch fits in 7 photos with one focal point photo, one smaller photo and two sets of tagged photos. I know how some of you love working with tags. So here’s one layout where you can play around with tags. Substitute the tagged photos with embellishments or extra journaling. Have fun! This scrapbook sketch accommodates 8 photos comfortably. It’s all arranged in a simple, classic, clean-cut format. 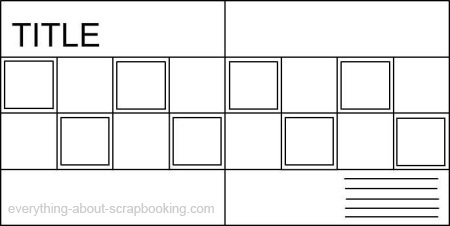 There’s also empty squares between the photos which you can insert in embellishments, patterned papers or journaling boxes. This scrapbook sketch has a more structured look. It accommodates 9 photos: 1 focal point photo, a photo-strip for 4 small photos and a block that fits in 4 square photos. It gives a clean, more linear look to the layout. These are the sample two-page sketches and if you’ve enjoyed them and would like more, be sure to check out 63 Double-Page Scrapbook Sketches eBook. But if you think single-page scrapbooking sketches are more for you, please check out this sketch e-book by Jennifer Gormly.